End-stage chronic obstructive pulmonary disease (COPD) refers to being in the final stages of the disease. This means that a person has significant shortness of breath even when resting and is at high risk for lung infections and respiratory failure. Many people associate the term "end-stage" with imminent death or grave disability that's leading up to death. But this isn't always the case. By definition, "end-stage" refers to "the last phase in the course of a progressive disease." Some people think the term is applied to a patient when health care providers feel that they've done all they can do medically for a patient. But there is generally always something health care providers can do for their patients with chronic obstructive pulmonary disease (COPD). It may just mean the goals of care have changed, from treating a disease to providing comfort. Stage I: Mild COPD. Lung function is starting to decline but you may not notice it. Stage II: Moderate COPD. Symptoms progress, with shortness of breath developing upon exertion. Stage III: Severe COPD. Shortness of breath becomes worse and COPD exacerbations are common. Stage IV: Very Severe COPD. Quality of life is gravely impaired. COPD exacerbation can be life-threatening. Each stage is defined according to spirometry measurement of FEV1 (the volume of air breathed out in the first second after a forced exhalation). End-stage COPD is stage IV or Very Severe COPD. While some in this stage are gravely ill, there are some who are not. Which group you fall into has to do with a number of factors that influence COPD life expectancy including your smoking history, your level of dyspnea (shortness of breath), fitness level, and nutritional status. Some people in stage IV are still able to function relatively well with few limitations. On the other hand, there are also many people at this stage who are very sick. Although surgical intervention may be an option (for example, bullectomy, lung volume reduction surgery, or lung transplantation), it's likely to benefit only a small number of COPD patients. For some, as the severity of their disease increases, the focus of treatment begins to shift away from prolonging life to providing palliative care to relieve COPD symptoms. Bronchodilators: Both short-acting and long-acting bronchodilators are recommended if shortness of breath during regular activity is not relieved by short-acting bronchodilators alone. Opiates: Morphine, in particular, may significantly improve shortness of breath. However, some studies show that it may have serious side effects and that it benefits only a select number of patients. Inhaled glucocorticoids: These may be prescribed for patients with an FEV1 less than 50 percent of the predicted value and a history of repeated COPD exacerbations. Supplemental oxygen: Oxygen reduces breathlessness caused by activity and improves exercise tolerance in patients with low blood oxygen levels. Noninvasive positive pressure ventilation (NIPPV): Noninvasive ventilation may lessen carbon dioxide retention and improve shortness of breath in some patients, but it's not routinely recommended. Pulmonary rehabilitation: This has been proven to benefit COPD patients at all stages of the disease. Nutritional counseling: This may be suggested because malnutrition is a common complication in end-stage COPD and increases the risk of death. Psychological and social support: These are an important aspect of treatment because many patients do not discuss end-of-life issues with their doctors. Complementary therapies: Relaxation and visualization techniques, therapeutic massage, and music therapy with live instruments, CD, or radio can help soothe symptoms like shortness of breath. If you believe the death of a loved one is approaching due to COPD, it's time to deal with managing their end-of-life issues. However, this can be incredibly difficult due to the debilitating nature of a chronic obstructive pulmonary disease. To complicate matters, research has shown that in spite of COPD's association with severe disability and premature death, COPD patients are still receiving inadequate end-of-life care. For these reasons, you and your family may want to consider enlisting the help of hospice to guide you through this time. Symptom management is one of the most important aspects of end of life care because COPD symptoms often worsen in the final days—most notably, dyspnea and cough, pain, anxiety and depression, confusion, anorexia, and cachexia. Overall, the end of a person's life can be a time of deep reflection for both patient and family. It can also be a time of great sadness. 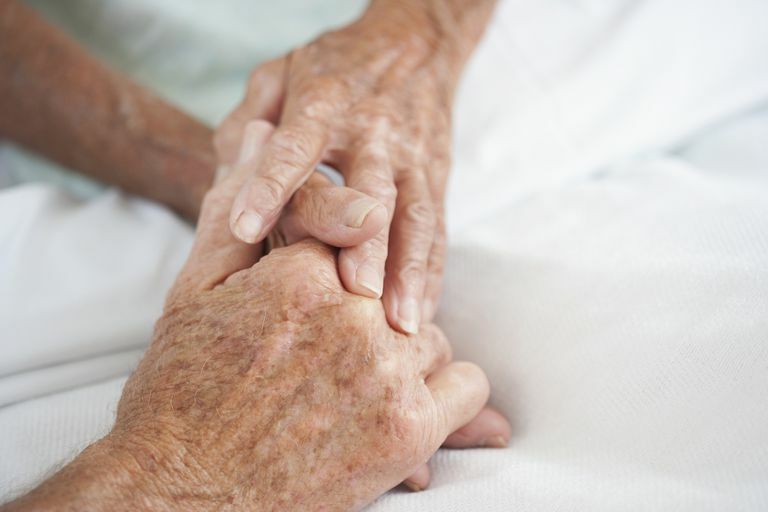 Remember that simple gestures like holding your loved one's hand and being present can provide immense comfort. If the disease has not yet advanced, there are several lifestyle changes that a person can incorporate lifestyle to maintain optimal health. Quit Smoking: Smoking cessation remains the single most important, cost-effective way to prevent and treat COPD. If your goal is to feel better, slow the progression of the disease, and live longer, then you should say goodbye to cigarettes once and for all. Exercise: Besides quitting smoking, if you are going to make one lifestyle change after a diagnosis of COPD that will have the greatest impact on your life, consider a daily exercise program. Eat Healthily: Good nutrition should be the foundation from which to start your journey after a COPD diagnosis, or even if you've been diagnosed for years and want to make positive lifestyle changes to help you feel better. It's an essential part of any disease management program and gives those with COPD the vital energy they need to breathe and fight infection. Stay Positive: Someone once said that life is 10 percent what happens to you and 90 percent what you do about it. Staying positive in the midst of a chronic illness diagnosis is difficult, but it's not impossible. It's all about developing some new coping mechanisms that will fit into your lifestyle. Understanding end-stage COPD and what you can do to prevent yourself from getting there starts with taking a long, hard look at yourself in the mirror and asking yourself one specific question: "Am I worth it?" The person who looks back at you will hopefully smile back and answer, "yes." Ambrosino N, Gherardi M, Carpenè N. End-Stage Chronic Obstructive Pulmonary Disease. Pneumonol Alergol Pol. 2009;77(2):173-9. Vestbo J, Hurd SS, Agustí AG, et al. Global Strategy for the Diagnosis, Management, and Prevention of Chronic Obstructive Pulmonary Disease. American Journal of Respiratory and Critical Care Medicine. 2013;187(4):347-365. doi:10.1164/rccm.201204-0596pp.